Lagavulin 16 year old single malt is my all-time favorite, so needless to say, I’m a big fan of Lagavulin distillery. Lagavulin is not known for wide range of whiskies: they have their flagship whisky, the 16YO, and a cask strength 12YO – both absolute beauties. So when I heard that they were releasing an 8 year old Lagavulin single malt, I was excited. Even though the skeptic in me was having some doubts. Lagavulin has done things their way, no jumping on NAS whisky band wagon, no over branding – just simply making great whisky. 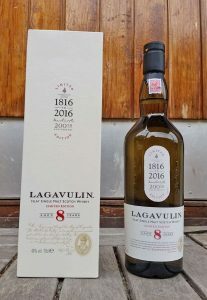 We still can’t blame Lagavulin too much about making a special “NAS release”, because Lagavulin 8 year old really had a good reason to be released. 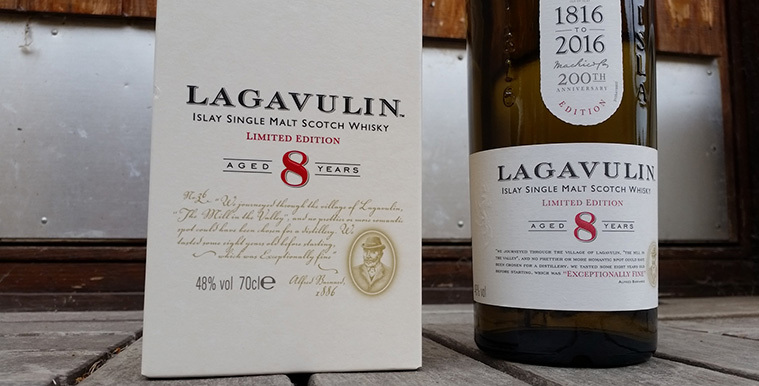 Lagavulin 8YO commemorates the 200th anniversary of Lagavulin distillery, founded by John Johnston in 1816. It comes with a nice 48% alcohol per volume level and it’s been matured in refill European and American oak casks. Why Lagavulin chose to make an 8 year old single malt in honor of 200th anniversary? Well, apparently this expression was inspired by the visit of Alfred Barnard, author of The Whisky Distilleries of the United Kingdom. Barnard visited Lagavulin distillery in the 1880’s and tried an 8YO Lagavulin, which he discribed as “exceptionally fine” whisky. That’s why Lagavulin thought that 8YO whisky would be a fitting tribute for their milestone anniversary. This fairly young but good dram is strong and smoky, with lots of sweet spots and peppery character as well. It is simple but good. I’ve usually made a reference regarding Irvine Welsh in my Lagavulin reviews but this time, because of the backstory, and because this single malt is strong but pure: I’ll just state this as Whisky Galore! (the original version). 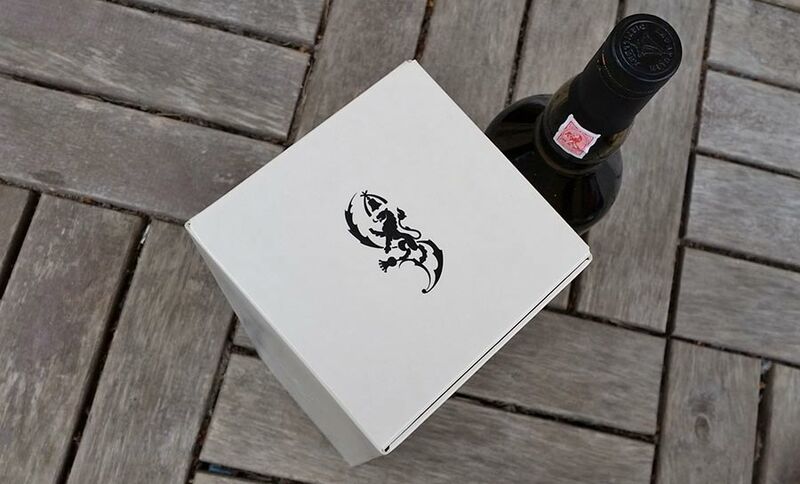 I wouldn’t mind finding 50 000 cases of this Lagavulin from a stranded ship. Nose: Strong with smoke and medicinal peat. Pine needless and fresh wood. Very peppery and pointy at the start but gets softer with time. Phenols and salty Islay air breeze hit you constantly, when nosing this phenolic beast. Finish: Peppers are there but sweetness takes over. Sweet smoke and iodine are the main notes in the aftertaste. Balance: Balancing nicely between strong smoke, pepper and sweet notes. Manages to be a powerful character and very clear at the same time. Whisky Bible by Jim Murray – controversial but necessary? 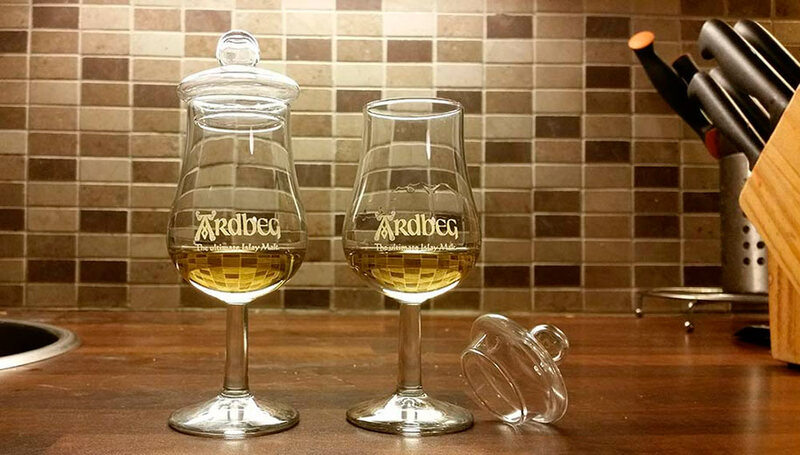 Whiskey decanters – any good or just eye candy?